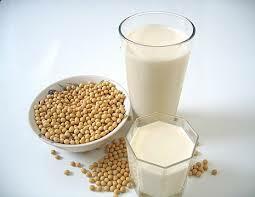 Soy milk is a good source of protein, iron and fibre, and also contains trace amounts of vitamins and minerals. It’s lower in saturated fat than cow’s milk. Soy milk contains antioxidants known as isoflavones, which are a plant-based form of estrogen. Many of the health benefits of soy are attributed to this, such as the decrease of menopausal symptoms and lower incidence of cancer of the reproductive systems. In China and Japan there is a decreased incidence of breast cancer and prostate cancer in comparison to other parts of the world. Researchers have accredited a diet containing soy as one of the reasons behind this. Soy has also been credited with lowering LDL cholesterol levels and reducing the risk of cardiovascular disease. However, not all the news surrounding soy milk is good. To date, soy is a controversial issue, with some nutritionists and medical experts touting its benefits and others its dangers. Research too is divided, with studies showing as soy having both positive and negative effects on the body. In 2005, the US government conducted a review of over 200 studies into the benefits of soy. The conclusion was that while there was a slight reduction to LDL cholesterol and reductions of menopausal symptoms such as hot flushes, these benefits where limited. One of the major criticisms of soy milk is its effect on the endocrine system, in particular, the thyroid. One study found infants fed soy-based formula were more likely to develop autoimmune thyroid disease. Other studies have found that large amounts of soy need to be consumed to effect thyroid function, or that other nutritional deficiencies need to exist for these effects to take place. Those suffering hypothyroidism or similar conditions may be advised to avoid soy completely. Another issue surrounding soy milk is processing. In Asian countries, where soy has been part of a traditional diet, much of what is consumed is fermented, and only eaten in small quantities as a condiment. In western countries, soy products including soy milk are often highly processed, and consumed in larger quantities. Some experts argue that small amounts of fermented soy do have health benefits, and that dangers are linked to large amounts of consumption. While locally grown soy is not genetically modified, much imported food with soy based ingredients is. While there is little research so far into the effects of GM foods on health, there are concerns held about the introduction of new allergens and increased antibiotic resistance. Genetically modified soy is found in processed food such as margarine, bread, pastries, chocolate, potato chips and mayonnaise. It’s also commonly used in feed for stock animals. Like many foods, soy milk has the potential to do harm in some areas and good in others, and again like many other foods moderation is key.